Have you been an admirer of Pakistani couture and wanted to flaunt it too? Then, Mushi Designers is a store you have to visit from some of the biggest Pakistani brands like Maria B and Deepak Perwani. Tucked in a corner inside Babu Khan Estate, Mushi Designers stocks a collection of Pakistani brands. Earlier called the Jammu and Kashmir Emporium, this store has been around for six years but has moved on from selling handicrafts from Jammu and Kashmir to Pakistani fashion. This store’s pile is anything but regular. Lawn and Chiffon fabrics with intricate embroidery work and pleasant colours to fit any mood can be found here. Think kurtis, kaftans, suits, sarees, and jackets (Of raw silk and wool). We say skip the sarees and jackets in favour of suits and kaftans that will leave you heart-eyed. Check out this casual print from Noor by Saadia Asad and this classy design from Qalamkar Luxury that you can buy and get stitched. 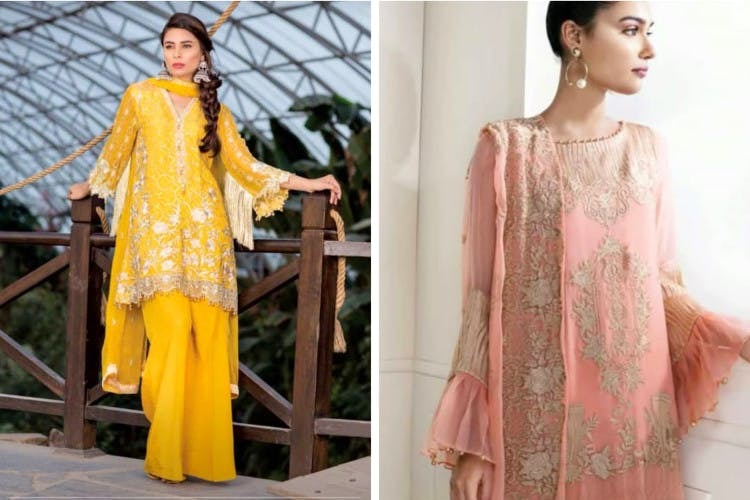 With imports coming in every 15 days, pick from over 30 brands (like Charizma, Agha Noor, Gul Ahmed and Zara Shah Jahan). With prices starting at INR 1,700, these will be an investment if you buy plenty! A section of the store sells Kashmiri/Pashmina shawls, hand-woven and in earthy colours. So, if you’re looking for a gift for your grandma or want one yourself, head here. These come with floral motifs, and traditional designs as well as in solid colours. Apart from all the imports from Pakistan and Kashmir, this store also has its own designs under the tag of Mushi. Comfortable nightwear kaftans in free size and kurtas of vibrant colours that you can rock to college are their original designs and manufactured here in Hyderabad. Since they only sell the dress material, you can also ask them for the details of the in-house tailor (If you’re clueless about where to stitch it from) and the shopkeepers will help you out with that too. So, be it a best friend’s wedding or a festival, dress up in a uniquely grand designer suit and make heads turn. They also have stores in Lucknow and Jammu & Kashmir, and ship all over India.